I’m embarrassingly ambivalent about a lot of holidays, and big ones at that. I can’t remember the last time I did anything for Easter (maybe an egg hunt when I was a kid? ), and most years I consider it a miracle if we end up having something fancier than pasta for Thanksgiving dinner. Valentine’s Day should be the same story – I mean, I detest all kinds of kitsch and forced sentiment – but try as I might I never seem to be able to ignore it. Nearly every year, despite my better judgment and my insistence that this year we’re definitely not buying into the holiday hype, some kind of celebratory treat materializes in my kitchen. Obviously I’m either an incurable romantic, or I just can’t pass up an opportunity to eat chocolate. I suspect it’s the latter. Then again, it could be because I’m always subconsciously trying to make up for the one Valentine’s Day we missed completely. I don’t mean that we forgot to celebrate it one year, I mean that once it simply did not exist. At least not the way days normally do with a start and an end and twenty-four hours in between. And it wasn’t just any Valentine’s Day, it was that all-important first Valentine’s Day Manuel and I were going to spend together after more than a year of long-distance love. What happened was that we were flying to Australia, and realized only after buying our tickets that instead of celebrating our first Valentine’s Day Down Under like we’d planned, we’d be stepping onto a plane in London on February 13th and disembarking 20 hours later in Sydney — on February 15th. Where did the 14th go? I don’t know, but somewhere over Thailand we decided to crack open the box of chocolates we had brought and celebrate as best we could. Except that being crammed in like sardines with dozens of other people kind of puts a damper on romance, so instead of feeding each other truffles at 30,000 feet we ended up sharing them with about twenty of our nearest neighbors. We certainly made a lot of new friends, but it wasn’t exactly the kind of Valentine’s Day you dream about in the flush of new love. So possibly to make up for that, or possibly just because I like chocolate, even if we don’t do anything else ostensibly romantic on February 14th there’s always something containing copious amounts of the brown stuff to look forward to. It’s funny, actually, since I’ve never found chocolate to be more conducive to romance than, say, vanilla or caramel, but whatever – I’ll take any excuse I can get. Oh, but there’s also something a Valentine’s Day dessert should definitely not be: too much work, since while the jury might still be out on chocolate’s effect on romance, the effect on romance of slaving away for hours preparing a too-complicated dessert is quite well established. In a nutshell, then, I believe a great Valentine’s dessert recipe must be two things: deeply chocolaty and ridiculously easy. In other words, something like this tart I dug out of the archives over at Gourmet. There isn’t much to say about it other than that it’s pretty darn perfect, a fierce hit of chocolate in an elegant, easy-to-assemble package. It reminds me of a classic French ganache tart, with a couple of important differences: the crust, a crunchy bed of ground-up cookies, is every bit as good as a pâté sucrée but about one-sixteenth as difficult, and the filling – while every bit as intense as it should be – is softer, silkier, and rounded out with an addictive hint of salt. I imagine you could doll up this tart in many ways: a splash of your favorite booze in the filling, a drizzle of raspberry sauce, a spoonful of whipped crème fraîche on top. Then again it doesn’t really need any of these. In fact, I’ll go so far as to say it doesn’t even need a fork and plate, that provided you remember to pre-cut the slices, your fingers will do just fine. You never know, this could be handy in case you happen to be celebrating the holiday someplace where forks and plates are in short supply – in bed, say, or crammed into an airplane seat at 30,000 feet. Though if it’s the latter, you might want to cut the slices a bit smaller to make sure you have enough to go around. Reading this recipe’s reviews on epicurious, the biggest hurdle seems to be the pan size. If you don’t have an 8-inch springform, which seems to be rather uncommon, you have two options. You could increase the proportions by about 50% and use a 9-inch springform, but keep in mind that will make a LOT of tart – this thing is rich. If you don’t want to be eating this tart until Easter, you could use a normal 8-inch cake pan lined with a round of parchment on the bottom; once the tart is cold you should be able to turn it out onto a plate in one piece. Otherwise you could just use these amounts in a 9-inch springform and have a thinner tart. If you do this, though, you’ll most definitely need to reduce the baking time; I would start checking after 12-15 minutes. And regardless of what size pan you use, you want to stop baking it when the edges are puffed but the center still looks wobbly and liquid. That’s the only way to get the promised ‘pudding-like’ texture. Put the oven rack in the middle position and preheat the oven to 350°F/175°C. Wrap a sheet of foil around the bottom of the springform pan (in case of leaks). Lightly butter the sides. Stir together the ground wafers and butter in a bowl until combined, then pat mixture evenly onto the bottom of the pan and 1 1/2 inches (3.5cm) up the sides. Bake until the crust is slightly puffed, about 10 minutes, then cool completely on a rack, about 15 minutes. Leave the oven on. Pat the crust back into shape if it has slumped. Melt the chocolate and butter in a saucepan over low heat, stirring until smooth, then remove from the heat and cool 5 minutes. Whisk together the eggs, cream, sugar, salt, and vanilla in a bowl. Whisk the chocolate mixture into the egg mixture until combined. Cool the tart completely in the pan on a rack, about 2 hours. Chill, uncovered, until the center is firm, about 4 hours. Serve cold for a firmer texture or at room temperature for a softer one. … "the flush of new love" so good. And this tart? That’s pretty swell, too. Happy day to you both! Lovey recipe. I think I should make it (if I go get the ingredients), as we won’t be able to do much else than stay home. I’m thinking of halving it and using a 15cm diameter spring form. Should be a bit flatter than the original recipe, but perfect for two! That’s a great Valentine’s Day story…and kind of a good way to avoid the holiday if one so desired…hmm…. hahaha this is one of the best valentines stories I’ve ever heard! the one about sharing a box of chocolates with 20 people in a crammed airplane, somewhere over thailand. grin! I’m drooling now. I knew there was a reason to buy that giant bar of dark chocolate on sale at the grocery store last week. 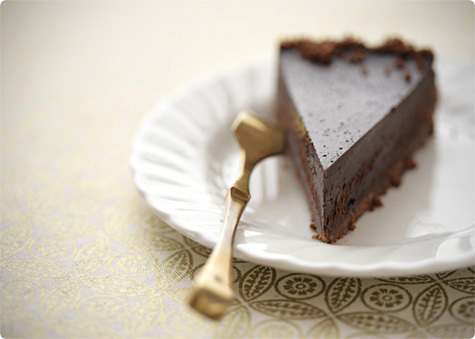 I had been thinking of making your Chocolate Heroin Cake (yet again) and may have to make this one instead…thank you! The tart looks and sounds incredible. May need to give this a whirl and see if I can pull it off. Thanks for sharing. Cela a l’air bon! Any excuse to eat more chocolate! Updating: I made the tart yesterday, but we’re eating it (part) today. As I said, I cut the filling in half, made 2/3 of the crust (plain, no chocolate waffers or cocoa), and in a 15cm spring form. It’s delicious! And so rich, we’re getting 6 servings out of the mini-tart. Thanks for the recipe! Oh, how glad I am I’m not alone on the holiday-deficiency front. This tart might just whip me into shape, though. Or at least earn me redemption for my lack of festivities. Heaven in a crust, it seems. My husband missed his 21st birthday in exactly the same way. However, he met me about 3 days afterwards, so swings and roundabouts, eh? This tart looks so completely divine that I think I’ll have to steer clear of it. If I bake it I might end up eating the whole thing myself which would be a valentine’s disaster. What a great blog you have here! I am so glad that I have stumbled onto your blog. This tart looks beautiful. This looks amazing!! Thanks for the wonderful recipe and making the recipe easy to follow. I will be making this for my family and friends. It looks professionals have made this pie and I want to be able to do the same. Thanks for giving me the idea. I’ve made this tart before. It is extremly rich, so you did go all the way on Valentine’s day even if you don’t think so. Oh my! This is heaven on a plate! Love the photo. Cheers! mmmmm….so rich and tasty! And what a gorgeous picture! This looks so right up my alley! Do I have to wait until Easter to make it?? It looks very rich & chocolatey! The perfect indulgence. Love your photos!